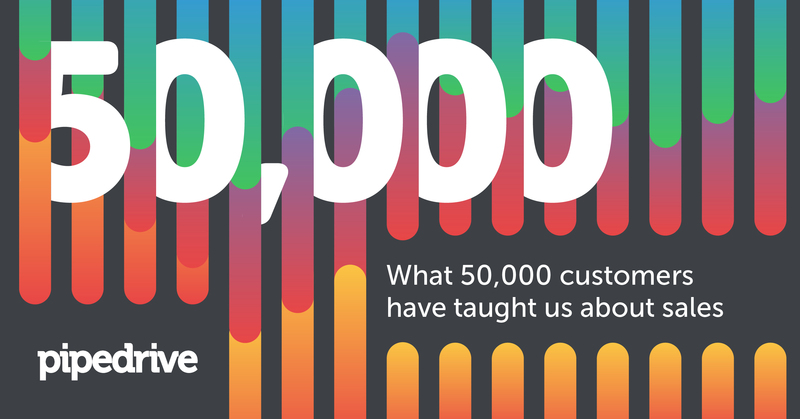 Pipedrive recently reached a new milestone – 50,000 paying customers. That means 50,000 companies, non-profits or solopreneurs in more than 140 countries have picked our product amongst the dozens of available CRM solutions. We feel indescribably proud, happy and humbled to serve you, and get a kick out of every closed deal and conversion rate improvement we've contributed to. Thank you 50,000 times! 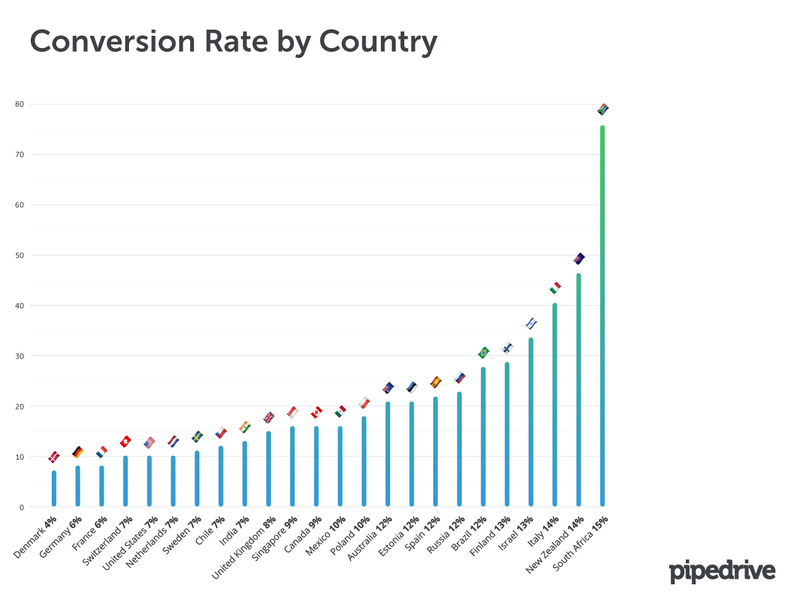 Usually, this would be an occasion to boast about the top brands using Pipedrive, the revenues generated by our users, the 240-strong team we’ve built (we're hiring, by the way), the nearly 100 integration partners, the 14 languages our app is available in, or the nifty features we've been working on. But that wouldn't be helpful information to very many people, and would feel too much like stroking our own ego. Instead, we took all of the sales metadata our 50,000 customers generated last year and dug into it to see whether we could learn anything new about sales around the world. What we found is quite fascinating. It often goes against perceived wisdom, destroys some well-regarded stereotypes and confirms that the world of sales is complex, multi-faceted and always surprising. 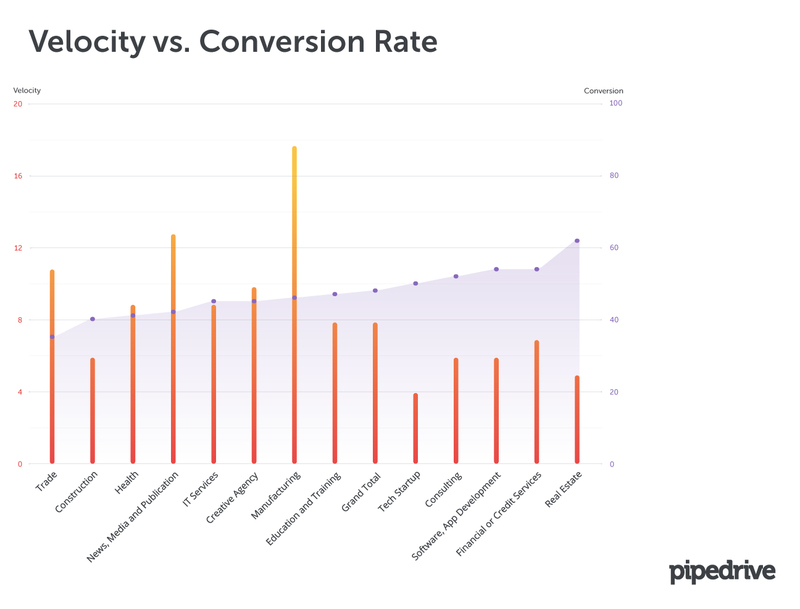 Conversion tells us how many of the deals you worked on turned into paying customers. This is called close rate. Looking at this metric in isolation, tech startups and real estate companies have had a pretty hard time in sales. When you’re only converting half as many prospects as the average across all industries, you’ve got to have grit to persist and keep on going. The manufacturing industry lives on the other extreme of the scale. 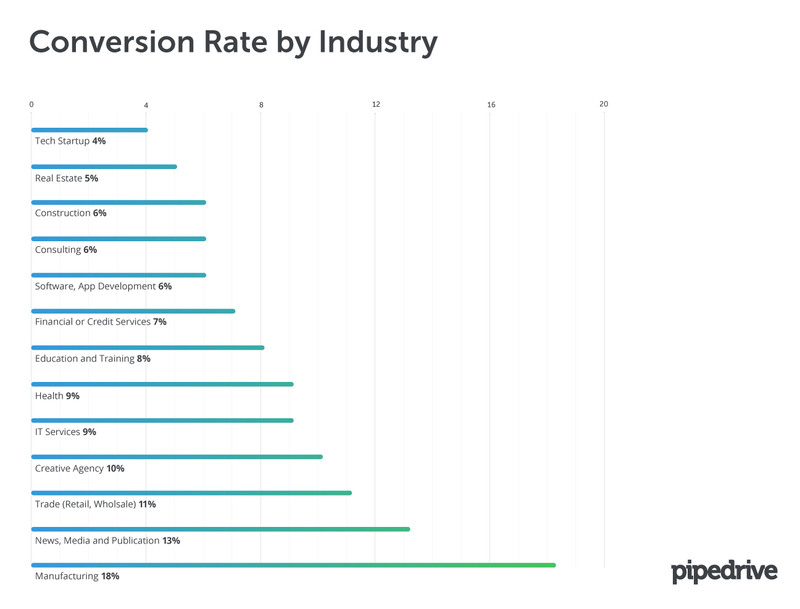 At over twice the average conversion rate across all industries, it seems like a great business to be in. Perhaps this takes place because most of the manufacturing business is inbound. (If you know the sector well, let us know in the comments). The differences in conversion are not only steep in different verticals, but also in different countries. Comparing the performance by country reveals that manufacturing sector sales are notably harder in some countries than in others. The best converters in the industry are the Singaporeans, Spanish, and South Africans. Germany, with its proud historical manufacturing roots, comes in last. Initially, we thought this could be explained by the very high competition in the mature and highly established sector. 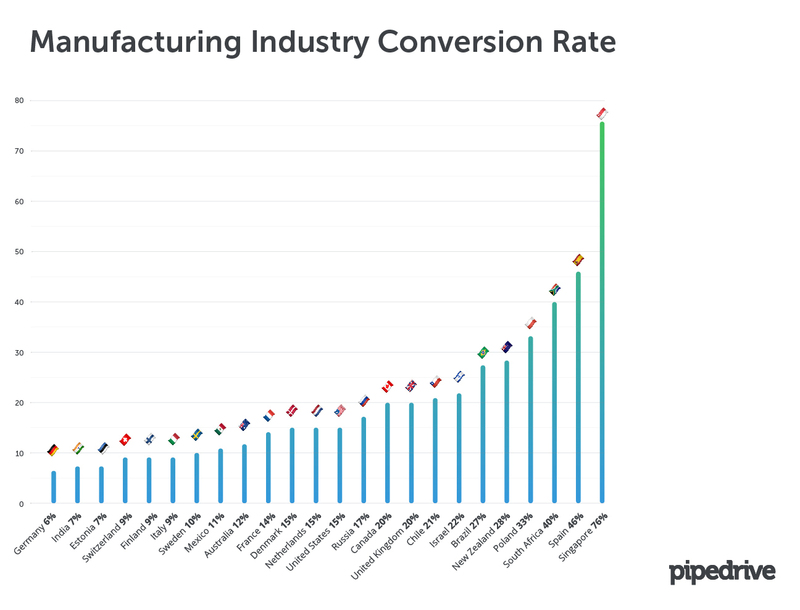 However, when we look at Great Britain, another traditional manufacturing great that now has an above average conversion rate, our argument falls apart. Looking at these statistics it becomes clear that Singapore is an obvious outlier, but then it is a unique proposition. A small, prosperous nation state that many people visit for the express purpose of shopping. This explains why they are so quick to convert, as well as their unique approach to using Pipedrive. We debated whether their singularity means they should not be compared to other countries, but feel it’s interesting enough to leave in. Just bear the situation in mind when their stats come up again later on. While Americans are often cast as the best salespeople in the world in popular culture, the statistics no longer support this claim. On the overall country comparison level, South African salespeople come out as the best converters. A South African colleague suggested it’s because people are pushed to be entrepreneurial, leading them to either run or work for small businesses to make a living. Having few public safety nets forces people to become smart, leading to great sales techniques, persistence and rigor. However, one needs to keep in mind that different countries will have different mixes in verticals and that, despite a few exceptions, more developed countries will have lower conversion rates, due to increased competition. 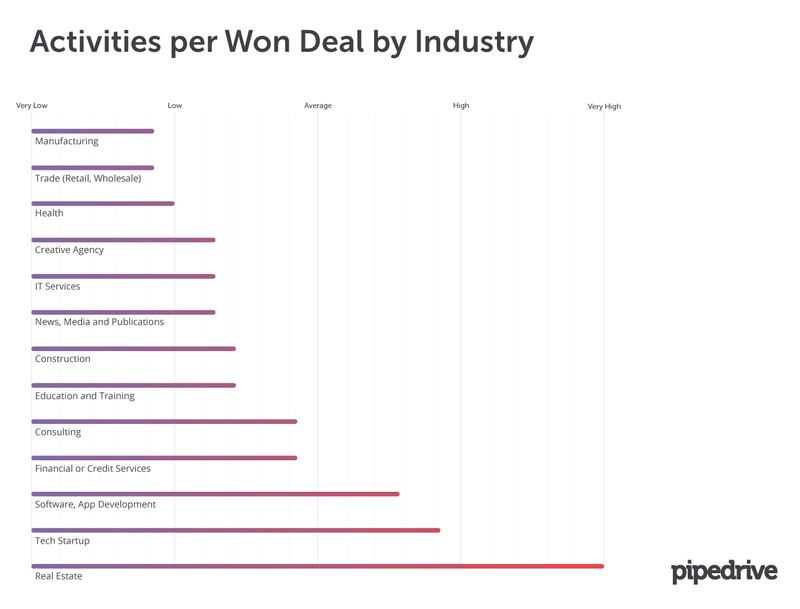 Activities completed per won deal tells us how hard you need to work on any one deal to turn it into a success. We get this figure by counting up all the phone calls, emails, meetings and presentations you made in a given time period and dividing it up by the number of won deals during the same time. Why do we count up the activities? It’s because in sales you cannot control results, only your activities. Topping the chart here is the real estate sector. However, this metric isn’t where you want to be topping the charts. In fact, salespeople need to work nearly three times as much to win a deal in real estate. Of course, buying property is a big decision for most people, which explains this statistic. On the other end, retail and manufacturing are relatively low-touch industries where you need (under) quarter as many activities for every closed deal compared to real estate. Looking at the country comparison in real estate sales, we see the usual suspects – South Africans – as the fourth hardest working salespeople. 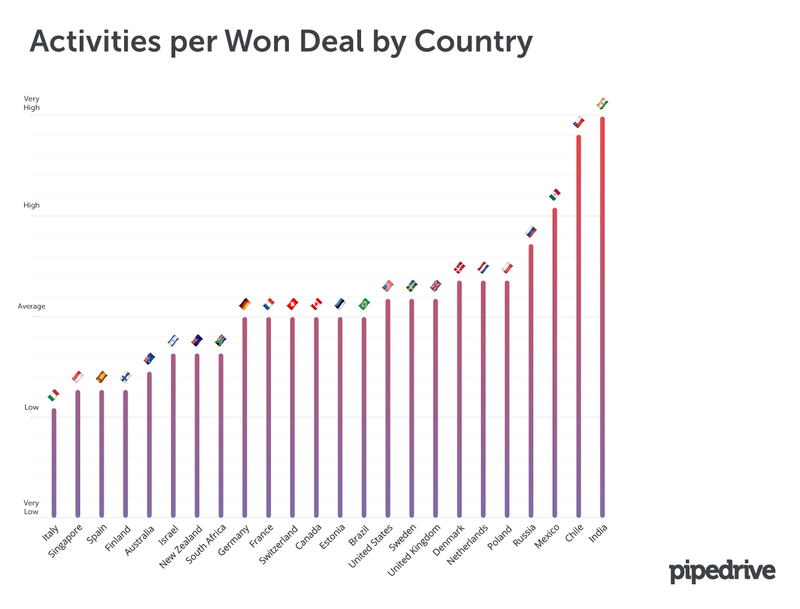 The table is topped by salespeople from Estonia, Singapore, and Sweden, needing to complete multiple times as many activities to win a deal compared to peers in New Zealand or Finland. 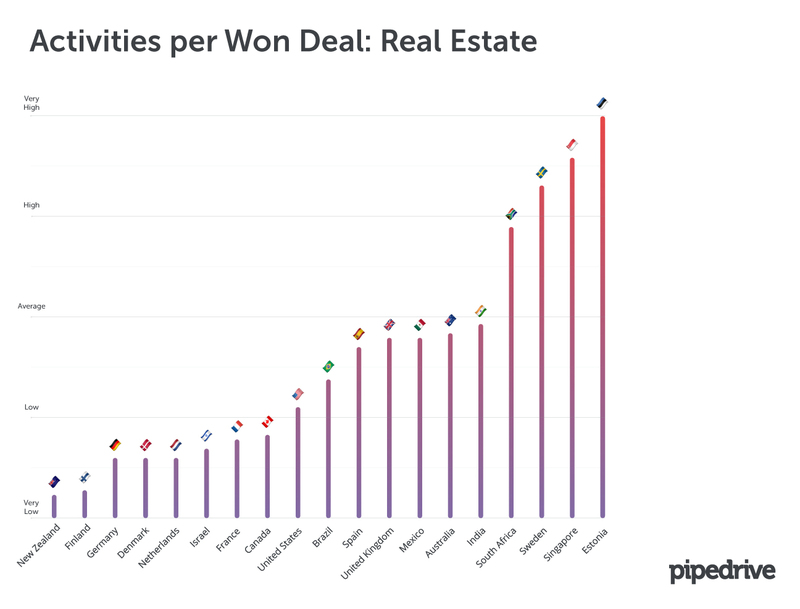 What’s interesting in the overall country level comparison, is that the highly active Spanish and Singaporean salespeople from the real estate sector don’t appear to affect the average activity levels of those countries by very much. Instead, they appear in the bottom five of the activity level list. The exact opposite is true for Russian salespeople. While they have the lowest activity level in the real estate sector, they come out fourth most active in the overall list after Indian, Chilean and Mexican salespeople. 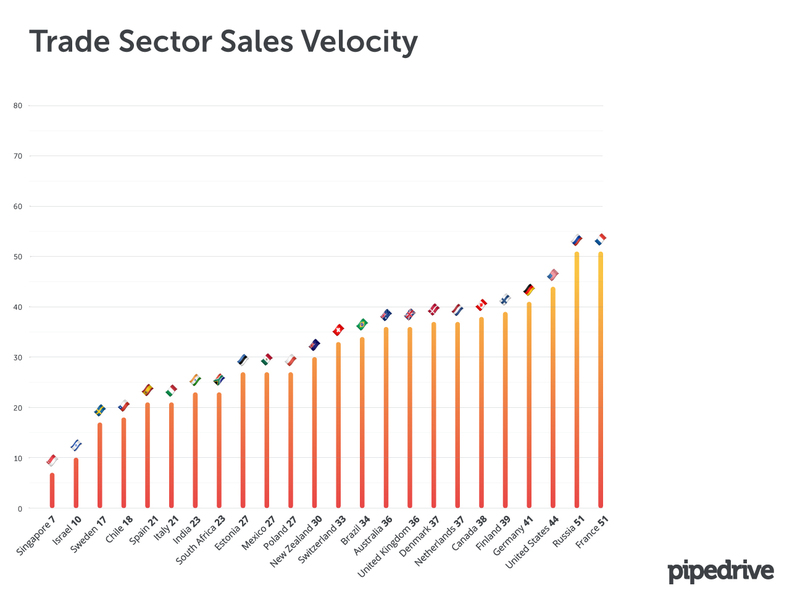 Sales velocity is a metric that tells us how long the sales cycle is – i.e. how many days it takes for a prospect to become a customer end-to-end. While trade companies seem to be moving fastest at 36 days – 13 days quicker than the average – the real estate sector again comes up on the difficult end. Singaporean salespeople have the shortest sales cycles at 28 days across all sectors. Perhaps surprisingly, the salespeople in the USA take the longest to take get to a “yes”. However, we can put this down to the US salespeople working in a tough sales environment. There’s lots of competition for attention, which means that buyers have lots of choice and leverage. In turn, the sales cycles get longer. Singaporean salespeople seem to have it all. Above average conversion rate, the shortest sales cycle, and the second fewest activities needed to close a deal. When we dug in deeper into the industries of Singapore, no real surprises presented themselves. They’re the fastest gun in the world even in fastest of industries – the trade sector. 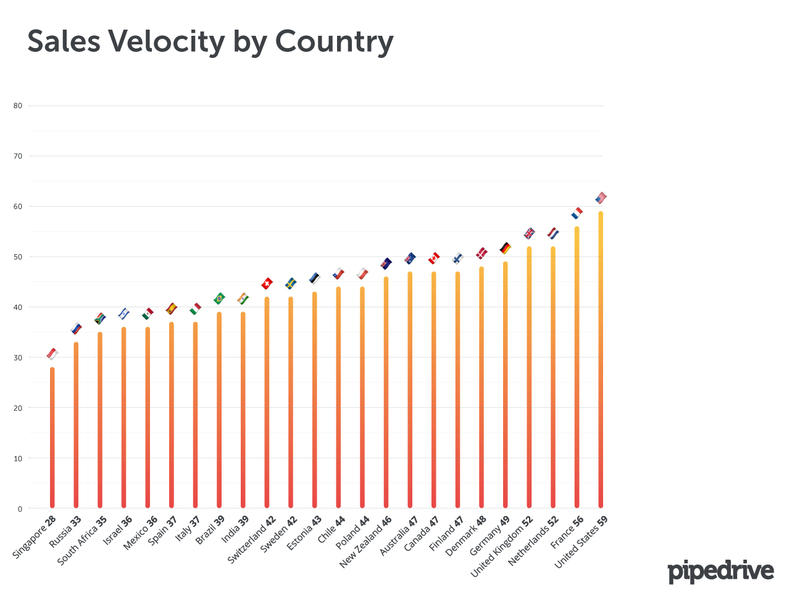 What we’ve seen is that conversion rate, sales velocity and activity levels vary extensively from industry to industry, and country to country. That said, any sales statistic should always simply be a guideline to improvement not an end in itself. Sales success is achieved through a focus on meaningful actions that drive pipeline performance, not results. Meaningful actions are ones that put new deals into the pipeline or drive current ones forward. A focus on these types of activities is the key to improving your KPIs. If you figure out your baseline conversion rate, you can do the math to understand how many phone calls, emails and proposals it takes to make one sale. Now that you have those action metrics, you know exactly what you need to focus on – hitting them consistently.